I had heard all of the negative comments about UCR before arriving here to work on my Masters. Upon arrival, I found all of these comments to be totally false. The staff is incredible. My prof's are EXTREMELY professional, helpful, approachable and brilliant. My prof's are Ph. D.s from Harvard, Brown, UCLA, Berkeley, etc. I did my undergrad work at a "yuppy" overly expensive private school and was extremely dissappointed there. 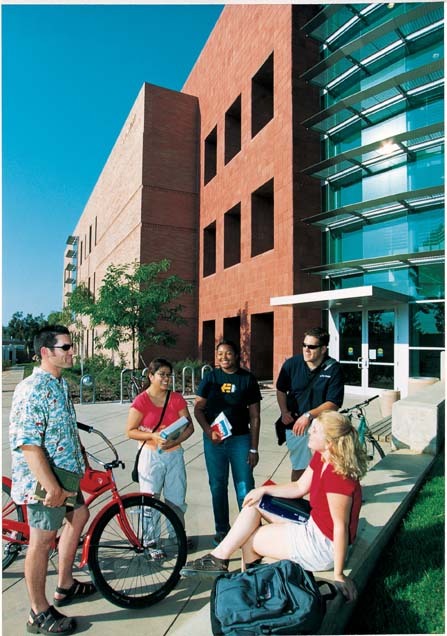 The professors are just as good at UCR, and the environment is much more conducive for work. I really think that within the next ten years, UCR will join the other UC's in the USN&WR top 50 list. I think it already belongs there in comparison to the top 50 I had already attended. There is a spirited liberal student body here that perhaps doens't exist at places like Berkeley or NYU (schools that have sold their "liberal" image to further their prestige and research funding). There is also a strong right wing student contingent, buffetted by the conservative, blue-collar (think lifted pickup trucks) "Inland Empire". The student diversity here is incredible too. Riverside is a calm, sunny, affordable place where serious amounts of student intellectual growth can occur. Don't expect LA here… think more along the lines of a desert experience, like AZ perhaps. The smog is crappy, but most of that blows out from L.A. and is not the fault of the University. The undergrad students of mine range from incredibly brilliant to "does this student belong at a UC?" Overall, I think the average UCR student is bright, far from conceded, and willing to learn and grow. It has been an amazing experience here at UCR and I would recommend that anyone and everyone should come here for undergrad or grad studies.